Discussion in 'Build Threads' started by Joshlisthaus, Oct 15, 2013. Sounds good buddy Word of the wise - If your going to show up a bunch of jeeps? Try not to put jeep parts on your Pathfinder. You will never hear the end of it. RobMcBee and Kap10merica like this. I want to turn this baby into a rock crawler capable to whoop all these jeep riders' butts, but i have very little cash. ajohnson, Land Crusher and ORV design and fab like this. I can't get a jeep or get a toyota, what i've got is what i'll keep. If you want to show up jeeps, leave the roof rack and accessories at the mall and send your money on offroad performance...lockers, tires, armor( sliders, slick bumpers that help you have a better approach angle and departure angle), winch and so forth. Basically what this guy said. Bullbars are garbage, kc lights are garbage, and what the heck is a subframe drop?? what the heck is a subframe drop?? I don't really know, but it sounds dangerous. Hey man I'm a Nissan Tech here in Raleigh if you have any questions about your truck I'll do my best to answer them. It is not really any different than the modern lifts for the newer 1/2 ton trucks. All that happens is that specially made spacers for the frame drop the entire front suspension, steering rack, and drivetrain straight down off the uni-body. On the tops of the struts more spacers are installed and for very little money and comparably little effort you can raise the nose of the truck 4". The rear is 4-link and coil, so a spacer or coil lift in the rear gets that end up. It works pretty well, I know of a few people that have run them for years on R50s Pathfinders. To the original poster: Is that one a manual transmission? '01 & '02 had the 3.5 VQ available with a 5-speed, it is supposed to be a pretty quick truck. I think the official HP number was around 250, up a tad from 240 with the Auto. He almost removed the front suspension at URE last weekend anyways! Me: "Josh put your front tire on that rock", Josh "ok", wham! Let the Jeep arse whoopin commence! Update: Subframe drop on the way soon, gonna move up to 35" All terrains (total 7" taller than stock). After my first trip to URE, My first priority is ground clearance. Bottomed out on almost every single mound. Other than a small dent in the subframe from dutch john, No damage. Second priority is traction. My highway tires stopped me from getting traction on dutch john twice and I had to be towed up both times. The lift will consist of a 6" suspension lift on the back axle and a 4" subframe drop in the front with another 2" suspension lift in the front. Halfway there! To OnlyOneDR: It is a Automatic transmission 3.5L V6. Ordering a Jim Wolf Pop Charger to replace my intake and give me a few more horses. 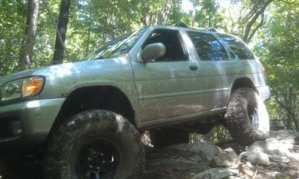 To The Anyone who says jumping up from 28" tires to 35" tires will destroy my fuel economy and kill my power: The 2001 Pathfinder R50 LE 4x4 comes standard with 4.34 gear ratio. With 35" tires, Ill have around 2700 rpm on the highway as opposed to about 2500 rpm now. 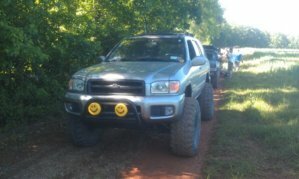 If you think anyone on here takes fuel economy into consideration when talking about making a rig better off-road, you are on the wrong forum. Its been hard finding parts for the pathy since its is not a popular rig. 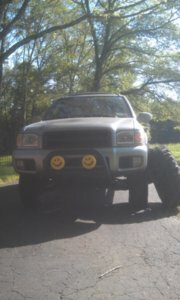 I've decided I will try and make my own bumper. The only winch bumper on the market is a $1,375 ARB. I will try and find a company to order steel from and I can find someone to weld it together. I am trying to save money by using less steel and getting a better approach angle. It'll be hard fitting a winch inside but it I bet I can save money somewhere. 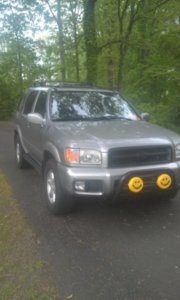 I will be using the bull bar I have now to try and make a grill guard on top and a small skid plate on bottom. I'll cut it in half and put some heavy plastic over the bottom. Its better than nothing for the time being. 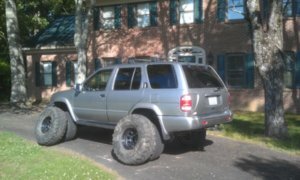 To Anyone who says jumping up from 28" tires to 35" tires will destroy my fuel economy and kill my power: The 2001 Pathfinder R50 LE 4x4 comes standard with 4.34 gear ratio. With 35" tires, Ill have around 2700 rpm on the highway as opposed to about 2500 rpm now. It will kill your power. Just give in to reality. The reason why it has 4.363 gears is because the low end torque is just not there. I have a Nissan, trust me, it had 4.636s stock. It was not because it was set up to tow, it was because that was the axle ratio that works with the power curve on the engine. That VQ35 is a nice engine with decent power, but once you jump way up in tire size it will soften the punch out a bit. Everyone that gets up to 35s needs at least 5.13s to make it tolerable, and anyone that does a SAS usually goes to 5.38s to make it work well. Yours has a high-pinion R200A front diff which no one makes aftermarket gear sets for, but you can switch to the 4.636 gear sets from another R50 for a small change. Lokka (maker of Aussie Lockers) sells a front diff lunchbox locker direct from Austrailia, and with the proper 31-spline axle shafts you can put a Detroit in the rear H233B axle (or cough up the change for an ARB air locker). Slap some sliders, bumpers, and skids on it and it will go places. Looking forward to see what you do with it. I always love getting feedback from people who can answer the questions I didnt even know existed. I wont let you down. You are very welcome. There are a few of us Nissan guys around. I have a set of 16" flat 4-spoke charcoal wheels 6 on 5.5" that are scratched up from wheeling on mine if you are looking for a set of "beater" wheels for it let me know. It will kill your power. Just give in to reality....once you jump way up in tire size it will soften the punch out a bit. Everyone that gets up to 35s needs at least 5.13s to make it tolerable, and anyone that does a SAS usually goes to 5.38s to make it work well. I wished I would've listened when more experienced people gave me this advice...hindsight's always 20/20! I know in my little 4-banger, 4.88 & 36s don't let me get to 3rd gear very often. Should I go for the bigger tires and throw in the pop charger or wait and get bigger gears? The automatic's torque converter will help out a lot, I would find the 4.636 gears and swap out promptly. For the front you just swap the entire centersection, for the rear you can just pull and replace the 3rd member. 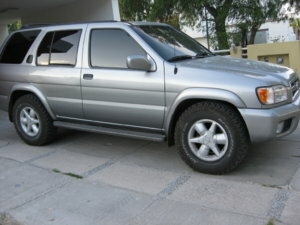 Both can be found on www.car-part.com, search for 1999 Pathfinder parts, you can get both for less than $200 before shipping.